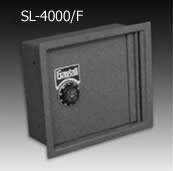 Wall safes have a 1" flange for easier installation. Designed to be recessed into a wall and concealed by a picture or a mirror. Available for 4" or 6" walls. Key lock option available - please call. Outside Dimensions(H W D): 12.5" x 14.375" x 4"
Inside Dimensions(H W D): 12" x 13.5" x 2.75"